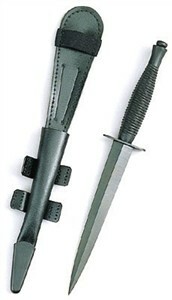 Designed by William Fairbairn and Eric Sykes just prior to WWII, the Fairbairn-Sykes combat dagger was first produced for the British Army in 1940. Built to the specifications of these two veterans of the Shanghai Municipal Police, the dagger design first produced by Wilkinson Sword became the most popular Allied commando knife of WWII. Many other companies produced their own versions such as this replica forged in Sheffield, England. The Fairbairn-Sykes dagger evolved through several patterns, but changes included only minor refinements. The ricasso, or un-sharpened section at the base of the blade, was replaced by sharpened diamond-cross-section blade all the way to the cross guard. Blade length varied, and this 11-3/4-inch model with 7-inch blade is a little shorter than some. The WWII version allowed penetration of three inches of heavy clothing and several inches of body beyond that, using the Soviet Army Greatcoat as a target standard. Although Fairbairn went on to design a second type of combat dagger, many professionals preferred this first design. The older version of the commando dagger saw continued use by many military forces long after WWII ended. This Parkerized dagger of high carbon steel uses a ridged metal handle over a rat-tail tang, held fast by an end bolster peened solidly in place. The non-reflective black coating extends to all parts of the knife, including the stainless steel blade guard. You'll appreciate the sleek black leather belt sheath almost as much as the knife.